They come in many sizes and shapes but if you’ve been in the game for awhile, you’ve had one or more of them. One of my earliest was Karl Heinz Rumminegge. Since coming to the Ozarks in 2002 I’ve looked to local products. I think it’s safe to say we have documented pretty well the two most recent classes and their efforts on the larger stage. The largest stage we can all aspire to is the World Cup. While we have not yet had a player perform on that stage, we do have an individual who has represented the US on the pitch. I had a chance to catch up with Ann Cook (Glendale 199x) for coffee earlier this week while she is in town visiting her family for the holidays. Ann is currently an assistant coach for the University of Nebraska women’s team. I asked if she would meet with me so that I could begin documenting her experiences learning the game here in Springfield as part of my Springfield History project. She was kind enough to do just that. This will be an opening effort on my part to share with you the growth of the community and in this case, the individual success that can be achieved. Ann grew up playing soccer here in a time when there were no high school girls teams. While Ann and her parents petitioned MSHSAA for the right to play on Glendale’s boys team, she was denied twice. Her club opportunities came with JB Marine in St. Louis where she was a member of two National Championship squads before moving onto William & Mary where she earned 1st team Division 1 recognition from the NSCAA. She also spent three years playing professionally for the WUSA, with teams in DC and San Jose, winning one championship with San Jose and reaching the finals with Mia Hamm at DC. She also earned a national championship and was tournament MVP with the Chicago Cobra’s, a semi-pro team, prior to the start of the WUSA. And most tantilizingly, she played with the US U20 Women’s national team for several years and made it to the final cut for the World Cup squad, earning one cap representing the US in the process. Cook was assistant coach at Glendale in 2003-04 and has been the director of the Ann Cook Soccer Camps and Clinics since 2002. 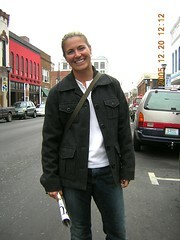 Prior to her stint at Glendale, Cook was head coach at Drury University in 1999 and 2000, producing a team in 1999 which ranked fifth among first-year NCAA Division I soccer programs that season. Cook played professionally in the Women’s United Soccer Association from 2001 to 2003, playing for the Bay Area CyberRays and Washington Freedom. Bay Area won the WUSA title in 2001 in the inaugural season for the league and Washington was the league runner-up in 2002. A 1997 graduate of the College of William and Mary, Cook won all-America honors three times in soccer for William and Mary. She played for two NCAA Division I quarterfinalists, served as team captain for two seasons, won Colonial Athletic Association Player of the Year and tournament MVP honors in 1997 and was a finalist for the MAC Award and the Hermann Trophy in both 1995 and 1997. Cook was on the U. S. National 20 and under team from 1994 to 1998 and played semipro soccer from 1998 to 2000 for the Chicago Cobras. Having her as coach definitely challenged me as a soccer player. There were days when I absolutely did not want anything to do with her because she was always so insanely happy to run us to death, and there were days where I loved her because I learned something new that would make me a better soccer player. I have never met anyone who knows the game of soccer better than her. Thanks! I think it is important not only what she has done in the way of her personal achievement but how she has helped with the girls in the area. She has worked with a number of the local teams over the years. I started working with her while coaching at Drury and have organized several clinics with her. The first year Tracker Soccer started she worked with my daughters team. Ann has been an inspiration for a lot of the girls. I remember the first time she worked with the team. It was announced on the website. I remember one of the parents telling me how their daughter sat straight up in bed that morning when she heard. At one clinic Rebecca actually juggled until she knew she had 2nd place so she could get Ann’s shorts from the Cyberrays. People can tell you how often she wears them. Ann has always put development and fun of the player before any of the local politics that have gone on in the area. She truly wants to see kids and soccer in this area develop. If you should need them I have pictures of her working with some teams and also the SI picture she is in with Chastain and Hamm. She signed it along with getting Chastain to sign it for my daughter. I met Ann for the first time during her time as the Drury head coach and she was first class. She arranged for some of her players to come out and work my girls team which at that time were 9 or 10 years old. She also brought about half of her team with her to one of my girls U10 league Championship games to cheer them on and she became very active with trying to promote female soccer in Springfield. Ann has appeared to make an attempt anytime she is back in town to work with girls soccer whether they are teams or individuals and she is just again a very hard working individual that loves the game of soccer and is very dedicated to promoting it at all levels. Bruce Hendricks coached Ann at a very young age with her dad Jim. Jim ended up coaching Chris Hendricks some and Bruce ended up coaching Ann some so they didn’t have to coach their own kids. Bruce talks about this girl in 4th grade that came knocking on his door one afternoon and while carrying on a conversation with him at the door she continued to juggle the soccer ball while waiting on Chris Hendricks to come out and play. Annie’s love for the game is apparent when you see how much she gives back to her own community. She has trained individual players as well as coached at the youth, high school and college level in Springfield and never has allowed ego, politics or money come between her and a player’s development. She has been a great role model for young girls both on and off the field. Ann’s impact on Springfield soccer is substantial especially for girls. Over the years she has spent time with various local teams teaching, mentoring and just talking to them about her career. Her willingness to give back to the soccer community she grew up in has meant that developing players like my daughter not only have a professional player to look up to and emulate, but they also have someone ‘just like them’ who is willing to spend time with them and teach them what it means to develop to the best of their ability. The training and interaction my daughter has received from Ann over the years has improved her confidence and focus toward her own soccer aspirations. More importantly, it has taught her a lesson about participating in your community and supporting those who follow behind you. I’ve known Ann for years. She is still a very good friend of mine. What has always bothered me about Ann’s publicity is that, well first, it’s rare; however, when she receives accolades, it is always couched around gender. Ann Cook is one of the best soccer players (not just women) to come out of this area . . . ever. Her accomplishments are even greater when you consider there was no place for girls to play soccer in this town in the 80s and early 90s. Her family traveled to St. Louis so she could compete on an appropriate level. She trained, played, and competed with boys and girls alike in this town. What I admire most about her is that she still plays and coaches because she loves the game. It’s her job and her passion. Write a good one, Steve. She deserves it. Ann is an important ambassador to the game in this town and deserves a lot more kudos, publicity, and thanks from the soccer community. I hope this does justice to the message the parents and players of this community had to offer regarding Ann’s impact. Like I mentioned at the start, this is just a first pass. If you have comments and stories to share about Ann or others you feel deserve attention for their efforts representing Springfield Soccer, leave a comment or send me an email at Ole at SGFsoccer.com.